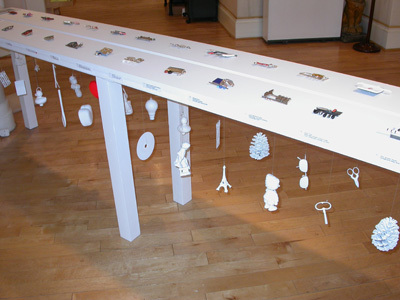 This exhibition returned to Glasgow and was renamedEnd of the Line (Roger Billcliffe Gallery 2004), signalling the final showing of this body of work. 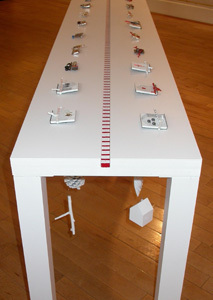 (figs 7.45 – 7.46) The installation took the form of one long table, marked down the centre with a red and white striped line, a linear marker. 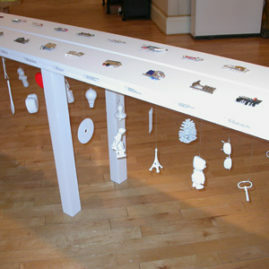 Hanging underneath each brooch was a familiar everyday object, painted white to neutralise its definition. As with the artefacts used in the installation of the exhibition Brooching the Subject, these objects were related to, and contextualised, the brooches.